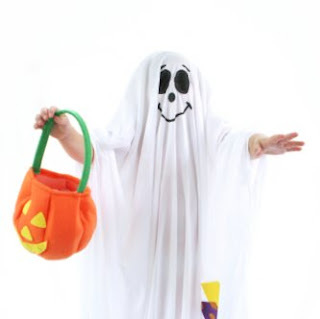 Today is Halloween! Sorry I didn't post more this year in terms of Halloween flavored stuff but I'm on the road and didn't really plan this far in advance to make sure I had all of my halloween goodies with me. (That and the fact that both blogger and rapidshare have been acting up lately) I do hope you enjoyed what little I did share. Anyway, enjoy the day and here's one last fun video for you! HAPPY HALLOWEEN!!!! This Is Halloween In Japanese!!! The complete 1932 classic directed by Tod Browning! Enjoy! The Addams Family Super Mega Post! I love the Addams Family. I own the complete series on DVD and can watch it over and over again and still find it entertaining. Back in college, my girlfriend at the time gave me a giant book of the original Chas Addams comics that the show was based on and I found a whole new appreciation for the Addams Family. I've seen the films from the 90s and I liked them, but don't really put them in the same category as the original series. 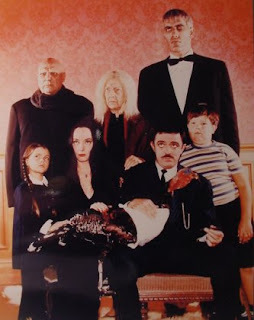 To me, that is the quintessential Addams Family and it will never be beat. Did you know that in 1977, they tried to regroup the Addams Family and put it back on the air in a whole new show? It's true! On Halloween, 1977, a television special named "Halloween With The New Addams Family" premiered as a test to see if it would be as well recieved as the original series running in syndication.The original cast was brought together once again to reprise their roles. The only exception was Blossom Rock (Grandma-ma) who didn't appear due to an illness. The feature was such an abysmal failure that the new series was cancelled before it even started. And speaking of Ted Cassidy, did you know that he released a single as Lurch simply titled, "The Lurch"? The producers thought that they would add to the show's success by putting out a record that would start a new dance craze. The problem was that the song didn't tell you how to do the dance. There was never any reference to the dance in the show and the song went unnoticed. 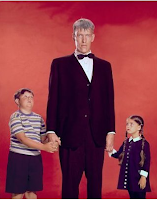 Some more interesting tidbits about Ted Cassidy; he played two roles on The Addams Family. Of course, we all know him as Lurch, but he also played "Thing". He also was the voice-over in the opening to "The Incredible Hulk". It would prove to be one of the last things he did before his untimely death in 1979. 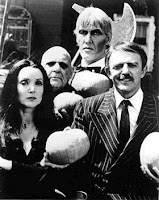 When The New Scooby Doo Movies came out in the seventies, The Addams Family were featured in not one, but two episodes, complete with the actual voices of John Astin, Carolyn Jones, Ted Cassidy and Jackie Coogan. The success of these appearances prompted Hanna-Barbera to put out an Addams Family cartoon a year later. However, Astin and Jones would not return. 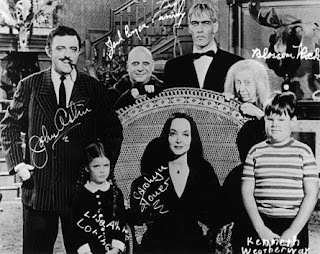 The cartoon appearances are significant in Addams culture because the family was drawn to the specifications of the original cartoons by Charles Addams, rather than how they appeared on their television series. The Addams Family continues to pop up all over and even as you read this, there is a musical being put together for the Broadway stage. Nathan Lane and Bebe Neuwirth have accepted the offered rolls of Gomez and Mortica Addams in the upcoming musical of the Addams Family that's set for 2009/2010. Here's one musician who hopes that he may end up playing drums for that production. Let's all keep our fingers crossed! In the meantime, here's a batch of Addams goodness for you: The original 1965 soundtrack to the television series by Vic Mizzy; The Ted Cassidy single, "The Lurch", complete with it's flipside, "Wednesday" and the original picture sleeve; The bootleg soundtrack from the 1977 Halloween special Enjoy! For even more Addams Family goodness, head over to The Addams Family Archive or you can just scroll down a few posts and watch the Halloween episode from season 1! The late Anthony Perkins appeared in many films and television shows but will always be remembered best as Norman Bates. In fact, I don't think there is one person out there who can honestly say that anyone else could have come close to the performance he gave in the original Psycho. They tried to have another person play Norman but it failed. There is only one Norman Bates and that's Anthony Perkins. But did you know he also had a singing career? This is true. During the late fifties, Anthony Perkins released several albums of his singing that actually sold rather well. In fact, he had a hit single in 1957 with the song “Moon-Light Swim.” It began in 1956 after he sang “A Little Love Goes a Long, Long Way” during a Goodyear TV Playhouse production of Joey. Executives at Epic Records were impressed with Perkins’ vocal abilities and they offered him a recording contract, which led Perkins to record a self-titled album for Epic in 1957 under the name Tony Perkins. Afterward he recorded two albums for RCA called From My Heart and On a Rainy Afternoon, both released in 1958. When his role in William Wyler’s film Friendly Persuasion began receiving a lot of praise Perkins decided to pursue his acting career more seriously and he never recorded another album. All of his albums have an obvious jazz influence. His first record was produced and arranged by West Coast jazz legend Marty Paich who’s better known for his work with artists such as Ella Fitzgerald, Buddy Rich, Shorty Rogers and Mel Tormé. There’s even a hint of Chet Baker’s influence in some of his recordings. Here is one of those records, the first one, "Tony Perkins." I have "On a Rainy Afternoon" but have not uploaded yet. Maybe next October! Here's Anthony Perkins singing away! Enjoy! An interesting side note about Perkins that you may not know: He died on September 12, 1992. Nine years later, on September 11, 2001, his wife, Berry Berenson, was killed when the plane she was on hit the World Trade Center. Even though he played Norman Bates, I didn't think this post was "Halloween-y" enough so I decided to post the soundtrack from the film that brought Perkins to fame. Here is the soundtrack to Psycho. Enjoy! 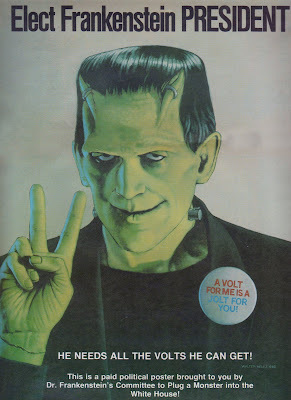 Saw this great pull-out poster from the old Dynamite Magazine floating around the web and thought it was fitting due to the fact that A) it's October and there's only 10 more days until Halloween; B) In case you haven't noticed, we are about to vote for our next president; and C) I used to own this as a kid and it hung in my room at one point. 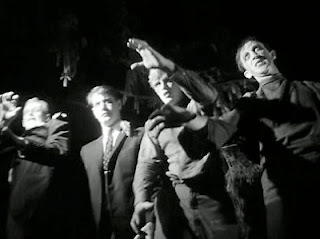 The Night of The Living Dead is one of my all time favorite horror flicks. I refuse to watch the remake or any of the other "Living Dead" rip-off films that have followed, but the original Romero classic will always hold a place in my heart. The music adds just as much as the visuals so I thought that I would share the soundtrack album with you. Here is the complete soundtrack album originally released in 1982. Funny how they never released this back in the 60s when the film came out. Since the 82 release, there have been two other releases featuring more and more music that wasn't on the original release. This however is the 1982 album on Varese Saraband. Here it is for your frightful listening! Enjoy! After giving the whole spiel on late night horror hosts for the Count Floyd post, I started thinking about my good friend Mark "Dangerboy" Nelson who, along with several other friends of mine, have started up a late night horror show in Keene, New Hampshire entitled, "Saturday Night Fright Fest". It's been on for over a year now and it's doing quite well. If you want to watch it, you can stream it live every saturday night at this website. It's on every Saturday night at 10 and every Sunday night at midnight. For those of you who aren't available at those times, here's a recent episode for you to enjoy! It features the film, "Tormented"! For more info on the show you can head over to their website! Here are a few radio commercials from the original release of John Carpenter's Halloween back in 1978. This has always been one of my favorite horror films and without a doubt my favorite slasher film. I love this and the sequel. After that, I think the plot lines get a little out of hand. 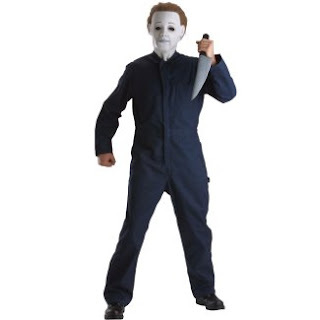 Though I did enjoy Halloween Ressurection. Anyway, here are those commercials for your listening pleasure! Enjoy!